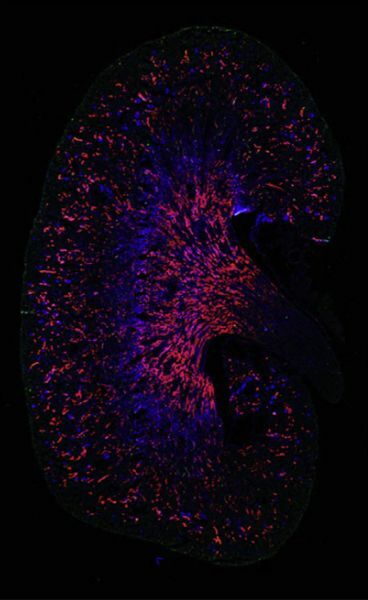 Researchers identify gene which initiates the repair of acutely injured kidneys. Acute kidney injury (AKI) is characterized by an abrupt decline in kidney function, leading to the accumulation of toxic waste products of cellular metabolism and derangement of electrolyte balance. Despite advances in medical care, AKI is associated with a significant increase in mortality, with in-hospital mortality rates approaching 50%–70%. Moreover, survivors of an episode of AKI show an enhanced risk of long-term progression to chronic kidney disease and ultimately end-state renal disease. Presently, no treatment exists to treat AKI. Now, a study from researchers at the University of Southern California, Centre de Biochimie and Harvard Medical School has shown that in the kidney, injured cells can be kicked into reparative mode by a gene called Sox9. The team state that identifying the kidney’s intrinsic mechanisms of repair is critical for developing treatments to kickstart the kidneys after AKI. The opensource study is published in the journal Cell Reports. Previous studies show that in AKI, damage-invoking responses trigger necrotic and/or apoptotic cell death depending upon the severity of injury and initiate endogenous tubular repair. This process restores tubular epithelial integrity, proximal tubule activity, and kidney function over several days. Genetic studies in the mouse suggest that surviving tubular epithelial cells proliferate and repair damaged nephrons. Whether all surviving epithelial cells have similar replicative/repair capability or a distinct subset of surviving epithelial cells effect repair on injury is not clear. Earlier studies from the lab identified activation of Sox9 as an early injury response signature within the nephron population in a mouse model of AKI. In development, Sox9, like other Sox-family members, maintains stem cell/progenitor states and promotes the differentiation of mature cell types depending on the organ system, timing, and tissue type. Moving on from these findings the current study shows that Sox9 engagement in proximal tubular epithelial cell repair after AKI. The current study shows that surviving injured cells switch on the Sox9 gene as a response to kidney damage. Results show that this regenerates the injured cellular lining of the nephron, the functional unit of the kidney, and repairs the kidney after AKI. The group note that proximal tubular epithelial cells are the most vulnerable cell type in these injuries in most mammalian species, though distal tubular epithelial cells are also affected in humans. Therefore, further studies must investigate this cell type in human AKI. Results show that by recruiting the majority of the surviving cells of the epithelium to aid in the timely repair of a severely injured organ, the kidney’s Sox9 strategy contrasts with the stem cell-based repair strategy of many other organ systems. Data findings show that in sections of the kidney that fail to repair, Sox9 remains activated thereby, demarcating regions of inefficient repair responses. The lab conclude that further studies of these regions could provide a crucial link between AKI and its transition to chronic and end-stage kidney disease. The team surmise that their findings show that Sox9 activation as an early response to renal injury and that Sox9 likely acts as a broad facilitator of epithelial repair. For the future, the researchers state that a controlled Sox9 mechanism may represent a novel repair process designed to rapidly recruit any surviving mature cell type post-injury into a reparative state. Fate Mapping of Sox9+ Cell Descendants Shows Extensive Contribution to the Ureteric and Nephron Epithelia. Representative image of the tDT in whole scanned 6-week old kidneys harvested after labeling with single dose of tamoxifen (2 mg, i.p.) at E16.5. Sox9 Activation Highlights a Cellular Pathway of Renal Repair in the Acutely Injured Mammalian Kidney. McMahon et al 2015.